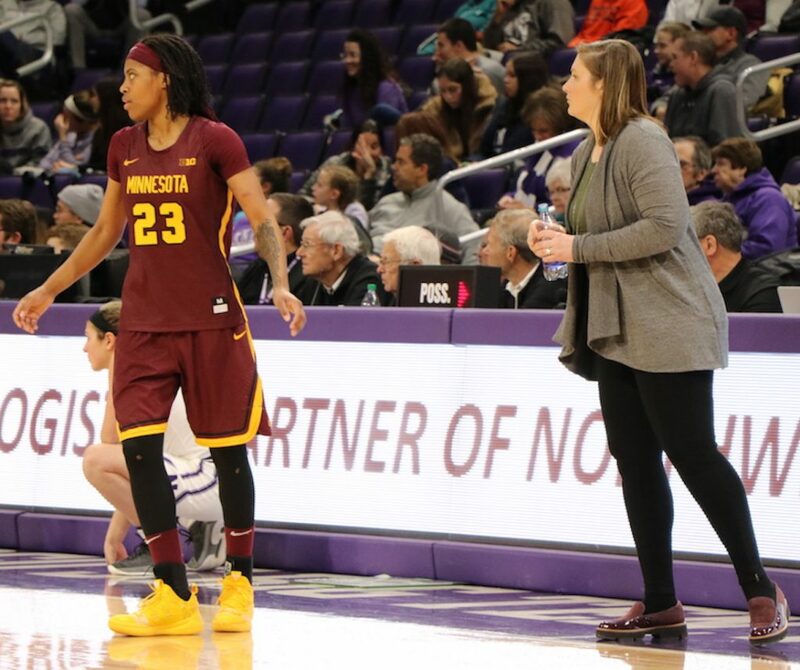 The Minnesota Golden Gophers were able to capitalize on these mistakes, as senior guard Kenisha Bell stole the ball from the Wildcats early in the first quarter, sprinting down the court for a powerful layup. This play would set the tone for the night, as Bell’s constant drives to the basket and her 17 points were crucial in helping the Gophers break their three game losing streak. In addition to her dominant performance on Thursday, Bell is averaging 18.6 points per game this season. Additionally, Bell was recently named to the mid-season watch list for the 2019 Naismith Women’s Defensive Player of the Year Award. Therefore, it was clear to the Wildcats before the game that Bell would keep their hands full on both sides of the ball. Minnesota extended their lead over Northwestern to 14 points with less than a minute to go in the third quarter thanks to standout performances from freshman guard Destiny Pitts and junior guard Jasmine Brunson who finished the night with 19 and 14 points, respectively. However, in the final moments of the third quarter, Veronica Burton scored three of her 13 points with a half-court buzzer-beating shot. Not only did this basket cut Minnesota’s lead to 11 points, but sent the Wildcats into the fourth quarter with a renewed intensity. Burton along with senior center Pallas Kunaiyi-Akpanah led the charge for the Wildcats in the fourth quarter, as Pallas capped off her 14 point, 11 rebound performance with a crucial layup through traffic, cutting the deficit to three points with 30 seconds to play. McKeown would then call his most important timeout of the game. Minnesota was once again able to capitalize on Northwestern’s turnovers, as the Golden Gophers would conclude the game by extending their lead back to seven points. The Wildcats will be looking to make these adjustments before their next game, an important conference matchup against Ohio State. The game will take place at Welsh-Ryan Arena on Sunday, February 3 at 3:30 p.m..